The Shropshire Prune is a small (1cm x 1cm) drupaceous, clingstone fruit. The fruit is oval and slightly pointed at one end. The damson tree bears magnificent white blossom in April and with good weather fruits are ready for harvest from September to October. Uncooked the skin colour ranges from dark blue to indigo and the flesh is a yellow-green. Cooking transforms the fruit into a dazzling deep red. In terms of flavour, the Shropshire Prune is the essence of ‘plum’. The plum is versatile and is excellent in both sweet dishes such as jams and jellies as well as savoury dishes such as chutneys and relishes. 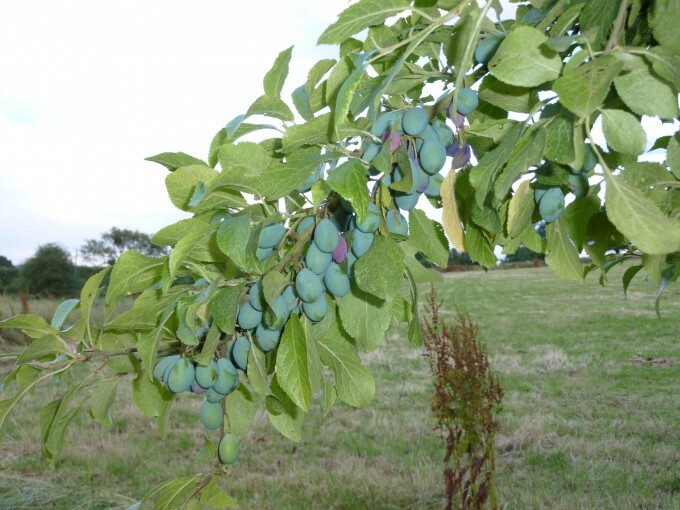 The Shropshire Prune is also used to make a range of alcoholic drinks such as damson wine, damson liqueur and damson gin. The Shropshire Prune, a type of damson, is a subspecies of the plum and is thought to be a hybridization of the bullace (wild plum). The damson has a distinguished heritage, having been introduced to the country by the Romans. The first written record of the damson dates back to 1676. The Shropshire Prune was common in Shropshire, Herefordshire, Worcestershire and Montgomeryshire within orchards and as a hedgerow tree. Shropshire Prune trees are a distinctive feature of the local landscape. Many Shropshire Prune trees were planted in the 19th Century to provide dye, however, this use no longer exists. Due to the lack of demand for Shropshire Prune dye, the trees have not been planted on a large scale and many orchards have been neglected. Currently there is no significant commercial culinary use for the Shropshire Prune and knowledge of this variety is more common among the older generation. There is a danger that such knowledge will be lost.